My 7th guest is my dear little sister Sapna. Sapna is one of those type of people who does not like to take sides when two people fight. She never sided with either of us when my brother and I used to fight. She is a very dependable person and can juggle a series of chores in a jiffy. I have not spent that much time with my sister but whatever time I have spent with her is memorable. I’m so lucky to have a sister with whom I can share all my joys and sadness, distance makes no difference. She immediately will know how I will feel and I will get a comforting message from her. She is a true friend, to whom I can open my soul and she will not judge me. I cannot imagine how people who do not have sisters get by. She’s always got a smile on her face, is very sensitive and very humble. My brother and I tease her that she owns a water work company… she can cry at a drop of a hat! Though she is my younger sister, I can depend on her for good advise on anything. I remember when we were little, she use to love wearing bangles and rings. She would get those jewellery sets from our toy shop and dress up. So once had put on a ring, the kind that you can adjust the size. She must have pressed it too hard so one end went into her finger. She probably was scared to tell my mum so it kept on going into her flesh till one day we noticed that her teeny weeny finger was swollen. Then all hell broke out… mum getting angry, us worried, our house help James trying to help my mum to remove it. I think in the end she had to be taken to the doctor. I’ve actually never heard my sister say that she loves cooking. She cooks for her large family, but I don’t think she ever discusses cooking the way I do with my sister in law Vibha. She loves travelling, reading, watching movies and American series. My sister Mayuri is a brilliant cook. I follow most of her recipes from her blog. When we were growing up she had to help our mum in the kitchen.I was the one who got away from any chores in the kitchen. Living in a huge family, there was plenty to prepare and cook. I never learnt how to cook until I moved to UK. My sister started cooking at a very young age. My childhood memories are of us playing in the garden at our home in Nairobi. We both would wear my mum’s saris and pretend to play house. Mayuri and I studied in a boarding school in India. We spent just a few years together. After completing her high school she moved back to Nairobi while I continued my studies in India. After her marriage, my parents moved to London and my brother and I joined them. However, my sister had to start her married life in Mombasa. Although we have not stayed together we share a strong bond. Tired of chinese stir fried rice..well here is another version and tastes delicious! 1.To make the cauliflower rice grate the florets using a cheese grater, the large holes or use a food processor and pulse till it resembles like rice. 2. In a small bowl whisk the sesame oil, ginger, white pepper and soy sauce. 4.Stir in the chopped broccoli, peas, carrots and corn stirring constantly until the vegetables are tender. 5.Add the cauliflower rice and the spring onions and cook till cauliflower is tender, about 3-4 minutes. 6. Add the soy sauce mixture. Mix it gently into the rice. 7. Serve immediately, garnish with sesame seeds and spring onions optional. You can also serve some soy sauce in a bowl for guests who want it salty. I had added some mangetout, bamboo shoots, red peppers and water chestnuts. If you want to make it spicy either add ground green chillies or chilli flakes. Also if the family eat eggs then use 2 large eggs and make an omelette. Add this in step 5. 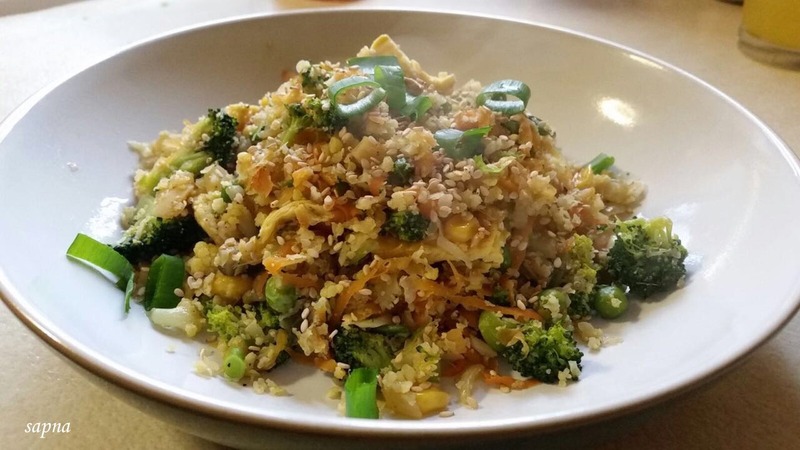 Cauliflower rice is quite a versatile ingredient. You can use it in various dishes. Prepare all the vegetables when you are ready to eat. I loved reading the Posts by both sisters. It's lovely to see how well yo both appreciate each other. I do make cauliflower rice sometimes but never tried making it like Chinese rice. Great idea. Thanks, my sister vouches that its a simply tasty healthy dish. You're right Shobha, one can make so many variations. Thank you so much for the kind words. You perhaps can try out the Chinese version next time.